Calla lily, also known as Zantedeschia aethiopica, belongs to the family of Araceae, a native to South Africa, Lesotho, and Swaziland. This trumpet-shaped flower grows easily with just a few important planting tips to keep in mind. It’s true! Calla lily plant care is rather easy for both growing and for flowering. Also known as trumpet lilies, calla lilies are mostly known for their waxy white flowers that twist and curl gracefully ending in a delicate point. You can grow calla lilies in pots – indoors or outdoors your garden. In cooler climates, you can grow them as annuals or simply dig them up in fall and replant them the following year. Given reasonably good care, each bulb will produce up to six blossoms during its flowering season. In areas where the temperature is warm, you can grow them perennially all year long. Although you can start growing calla lilies from seeds, they take very long to germinate. In addition, the calla lily seeds have a very low germination rate. It’s best to begin growing calla lily using bulbs. Use deep pots and plant one bulb in a five or six-inch pot. In eight-inch or larger containers plant two or three bulbs. If you want to grow you Calla Lilies in pots they look best when the dormant tubers are started in larger pots. When planting callas allow the tops of the tubers to barely stick out above the soil. Although the roots of the Calla lilies do not spread out much, using large pots will help the soil to stay moist as well as allowing enough space for the tubers to spread and make additional plants. You’ll find all kinds of elaborate recommended soil mixes for calla lilly but all need a well-drained soil. I’ve been successful using a simple mixture of 1 part garden loam and 1 part peat moss. Some people swear the best results come from using cow manure in growing their callas. I’ve seen great results by using biweekly feedings of liquid fish emulsion fertilizer. If you live in areas that high temperature or the frost has already past you can plant the tubers directly in the garden. For the best results, bury the tubers three to 4 inches below the surface of the soil. Water Calla’s well and place them in a bright location until growth begins. Calla lilies need plenty of water all during their growth cycle. At maturity, they can almost stand in water. Watering the lilies regularly will ensure the soil stays moist. Calla lilies need to be hydrated all the time. Remember plants grown in containers tend to dry out much quicker than those grown in the ground. However, the soil should not be too wet since the lily bulb may start to rot. One of the indicators that you may be over-watering the plants is the presence of dark leaf tips. When fertilizing calla lilies you can use water-soluble all purpose plant fertilizer as well as bulb fertilizer every month. You should apply the fertilizer more regularly when you start noticing the development of flowers. However, you should stop fertilizing when the plant has already bloomed. If you notice some dark tips on the foliage you may have added too much fertilizer. Calla lilies do exceptionally well as floor plants. However, they need to be placed in areas with plenty of sun. This may be near glass door or near large windows. You can also use the calla lilies grown in planters to enhance your patios, porches, garden, and decks. What’s The Best Temperature Range For Growing Calla Lily? If you reside in areas where the temperatures are low such as the Pacific Northeast you can try selected varieties, which can tolerate cooler temperature outside. However, when the temperature is extremely cold, over winter calla lily plants in containers. In conclusion, it is very important to provide good care for the Calla lilies by maintaining a well-draining soil and add some coffee grounds to the plant’s growing container to make it more acidic. Remember although the plant can live year round in the appropriate climate, 60-75 degrees, allow it to die (rest) for two to three months every year. This allows the lily to rest and come back with better blooms the next season. At the end of the growing period stop feeding and watering the plants to allow them to go to dormancy. Callas kept in constant growth without a dormancy period will not flower well. They should be repotted into new soil every year. Cut the plants to ground level and bring the pots inside if you reside in areas that experience cool climate. Store the pots in cool, dark areas that do not get colder than 40 degrees Fahrenheit. Alternatively, you can dig the tubers out of the pot and store them in containers with peat moss for the winter. Can Calla Lilies Bulbs Be Forced To Bloom? Depending on when the bulbs are available, and when they are planted, the calla lily flower may be forced into bloom at almost any time as houseplants. 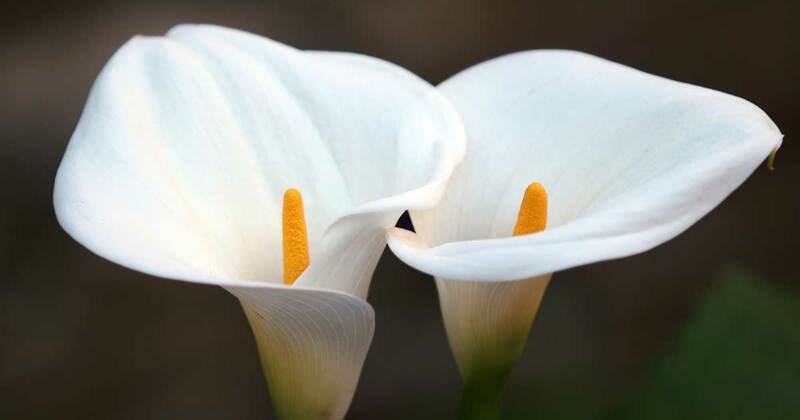 August and September are the time-honored months for planting the classic white calla lily flower, Zantedeschia aethiopica, and its fragrant flowers come during the winter and early spring. Yellow and pink (or red) callas are usually planted in January for spring and summer bloom. If you are situated, as I was, so that yellow and pink calla bulbs arriving in January are likely to be frozen, ask that they not be delivered until April. Choose an ideal spot for planting the bulbs. If you reside in a hot climate, make sure you choose an outdoor spot that gets partial sun and retains moisture. If you live in a cooler region, select an area with full sun and moisture. After selecting, the ideal location for planting the calla lilies makes sure the ground has been prepared well. It is important to enrich the soil with organic material which helps retain moisture. This is very important especially if you have sandy or rocky soil. Transplant the started bulbs and plants. It is not advisable to plant the tubers directly to the outdoors before taking care of them in the starter pots. Once they have started your tubers transplant the lilies into the garden. You should do this once there is no threat of frost. The ideal spacing for these Lillie should be at least 12 inches apart. Remember some Calla lilies can grow as tall as 4 feet with their leaves spreading to one foot or more. Watering the plants. Ensure that the soil remains moist throughout the growing season. It is also very important to fertilize the lilies regularly using a water-soluble general plant fertilizer. Remember to fertilize more than normal when you notice the flowers are forming. Stop feeding and watering the plant at the end of the growing season. This will allow the soil to dry and the lilies to die off. Even if you live in a warm climate, the lilies need to go into a period of winter dormancy for them to bloom again the following year. Dig the calla lilies out of the ground before the first frost. If you reside in areas where the climate is cool, remove the plant from the ground. You’ll need to grab the plant close to the base and rock it back and forth until you loosen the soil at the base of the tuber and they pull it carefully from the ground. To pick all the tubers sift through the soil with your hands or turn it carefully with a hand shovel. This allows you to find any small tubers that may have formed underground but did not have time to grow a plant. To prepare the tubers for storage, cut all the remaining plant material from the plant and lay the tubers in the sun to dry for a few days. Store them in dry peat moss inside a paper bag. You should keep them at 50 to 55 degrees Fahrenheit. Most of the tubers are in form of clusters. Break them apart into single tubers before you plant them in the spring. In case you find small insect pest on the lilies usually plant lice (aka aphids), you can control them using insecticidal soap or a spray safe like neem oil on your plants. You can also spray the respective pesticide to prevent diseases such as gray mold, rhizome rot as well as bacterial soft rot. Question: Are calla lilies properly planted in the Fall for Winter bloom or in the Spring for Summer flowering? Answer: The wonderful thing about these lovely plants is that they are versatile enough to flower during either period – whichever you prefer. However, do not expect the same bulbs to reward you with flowers both times. Separate bulbs must be used, in order to allow for the needed rest. Winter is the natural blooming time. Why Is The Color Fading On My Calla Lily? Question: I have grown calla lilies for several years. The calla lily flowers on one plant have always been a deep-yellow. This year the deep-yellow disappeared and the calla produced pale-yellow, very light-colored flowers. What would cause the blooms to be so pale? Answer: Genetics play a significant role in flower pigment color in calla lily plants. I would start with a soil test to get a reading of the pH and to see if any soil nutrients are off. Fertilize them regularly with a balanced mild liquid fertilizer every other week – try composted tea or fish emulsion fertilizer. NextDid You Know Indoor Plants Are A Stress Buster?